When it comes to purchasing wholesale e-liquid in bulk to resell to your own customers, it’s important that you find the right balance of selection, quality, safety, and price. These five questions will help you decide which vendor is the best option for not only your needs, but also the needs of your customers. #1 – Do You Have Insurance? When you purchase anything from a wholesaler with the intention of reselling it to your own customers, it’s important that you have peace of mind. That’s why you should ask your vendor if they carry insurance on their products. Americanmadebulkeliquid.com offers full product liability, which means coverage is extended to all our bulk buyers and their customers. This lowers your liability risk and allows you to rest comfortably in the knowledge that you are providing a high-quality, safe product. #2 – Are You FDA-Compliant? In recent months, the FDA has become much more involved in the electronic cigarette industry. They have already incorporated a few new guidelines, and they plan to enforce even more. You should ask your vendor whether they are ready to be FDA compliant once those new regulations go into effect. Vintage Joye prepared ahead and is already compliant with those regulations. #3 – Do Your Products Contain Harmful Chemicals? Although the FDA has yet to step in and ban harmful chemicals from the e-liquid manufacturing process, many manufacturers have already eliminated those chemicals to provide a safer, higher quality product to their clients. Ask your vendor whether it uses chemicals such as acetoin, propionyl, or diacetyl in its liquids. If so, remember that you can find better products. Vintage Joye’s e-liquids contain none of those chemicals. #4 – How Do You Test for Product Safety? 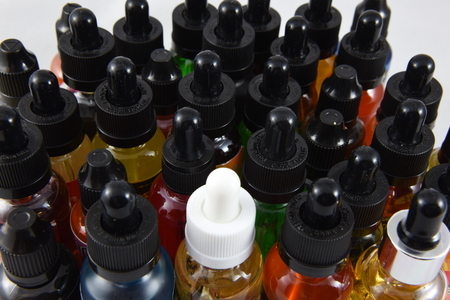 Many e-liquid makers test their products on-site for safety after they’ve been manufactured. While this is certainly a step in the right direction, it does not guarantee product purity or quality. Ask your vendor how they test for product safety. In the best-case scenario, they will utilize third-party testing for everything from the ingredients going into the liquids to the finished products themselves. #5 – What Happens if I Have a Problem? This is a question that you should ask any e-liquid supplier. They should tell you what kind of plan they have in place to protect you in the event that someone has a serious problem with a product. For example, Vintage Joye uses lot numbers, which allow products to be traced back to the original suppliers. We can pinpoint where a problem exists and take care if it quickly, though our third-party testing process typically eliminates any potential problems. Choosing an e-liquid provider can be more difficult than you think, especially if you are trying to find the right balance between quality and price. Vintage Joye is always a great option when you want to buy e-liquid in bulk for resale, but if you want to shop around, be sure to ask the aforementioned questions prior to making a decision.